Here we have a heist film in which the most devastating image conceivable in the genre gets an explosion of laughter from even a small audience. Stanley Kubrick had made some documentary shorts and a couple of barely feature-length films he considered juvenilia (Fear and Desire and Killer’s Kiss), but The Killing is widely agreed to be the first real Kubrick film — archly stylized, sardonic, gimlet-eyed, and richly entertaining into the bargain. Told in a non-linear fashion — informing such later films as Reservoir Dogs, though Quentin Tarantino will insist he’s not a Kubrick fan — The Killing hops around a heist at a race track, viewing the events from the perspective of various men involved. In truth, though, the effect isn’t so much Rashomon as a dispassionate God’s-eye view. As he would so many times afterward, Kubrick looks at the totality of the chessboard and dismisses the players as potzers — a term amusingly used in the film by wrestler Kola Kwariani, who used to frequent the same chess parlor Kubrick did. The wrestler is there to create a diversion by starting a fight. He and several others, including milksop Elisha Cook Jr. and über-hipster Timothy Carey, have been hired by scowling mastermind Sterling Hayden (whose bottom lip pouts out farther the worse things get) to be little pieces of the puzzle. The goal: to walk away with $2 million from the track’s coffers. Kubrick, who loved to sit back and laugh at the hubris of lesser men, lets us see all the planning, all the angles, and then mercilessly sweeps the chessboard. As in most film noir, a dame holds the key to doom. Elisha Cook Jr. babbles about the plan to his disdainful wife Marie Windsor, who promptly turns around and presents her lover Vince Edwards with a counterplan to rub out her husband and make off with his cut of the take. But the Cook character is so detestably weak we almost don’t blame Windsor for treating him so badly. (I can’t recall who wrote it, but I swear I once read Cook described as someone who looked born to get slapped around.) So the femme fatale stuff here doesn’t come off as misogynist; if anything, it reflects poorly on the man who falls for it. Potzer. 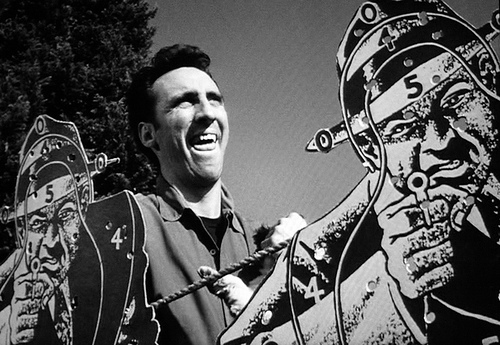 Perhaps even more here than in Kubrick’s subsequent Paths of Glory, Timothy Carey bops into the picture on his own suave-hostile wavelength. When he’s acting opposite Sterling Hayden — who reads his lines in the abrupt, manly cadence expected of actors before the Method really took hold in movies — Carey creates a split-screen, where he’s in a Timothy Carey movie and Hayden is acting (strongly enough) in a regular ’50s film. Carey had a grimacing Kabuki quality that Kubrick seemed to love, and seemed to chase in all his films thereafter, either from the leads or from supporting players. Irony abounds; fate throws in elements that these potzers can’t account for — a horseshoe, a lapdog. But The Killing is too hip to salute the old saw “Crime doesn’t pay” or even “There’s no honor among thieves.” Kubrick doesn’t truly seem to care about the heist or its participants. It’s the design, the amused tone of bleakness, that he’s really after. There’s a laughably overexplicit Captain Obvious narration — “Ten minutes later he bought the largest suitcase he could find,” we hear over footage of Sterling Hayden toting a large suitcase. The studio demanded narration to clarify the back-and-forth temporal movement for the audience (the potzers); Kubrick hated it, and probably strove to make it as contemptuously lame as possible. The narration doesn’t hurt things; it becomes white noise, as does the plot itself. The point of the film becomes the little mordant flicks of the brush, like a death scene played out next to a bleating caged parrot. “Watch it there! Watch out!” it cackles uselessly. The Killing may be the greatest of American heist films because it bursts the genre to the point of existentialism. Whatever you work towards or aspire to, Kubrick says, here and most everywhere else, will dance out of your reach; or you’ll get it, but not how you expect. And Kubrick says this in an icily merry mood, a wised-up chess master making films about dumb pawns and expecting you to keep up. Because you’re not a potzer like them, are you?